Now you can honor your favorite Scout with a personalized version of the popular “Legend of Eagle Mountain,” as featured in The Eagle Court of Honor Book. 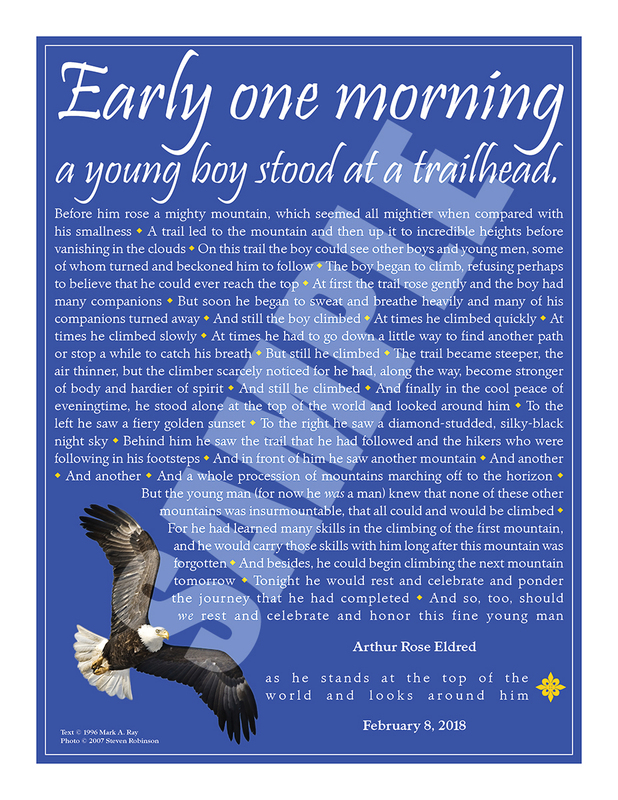 This certificate tells the story of a boy’s climb to Scouting’s highest peak: the Eagle rank. 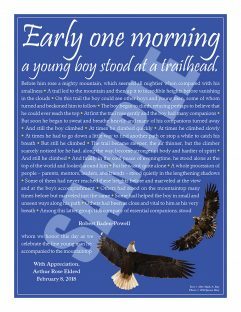 The perfect gift for any new (or not-so-new) recipient of the Eagle badge! Choose between the classic design on parchment-style paper or full color version, 8×10″ or 8.5×11″ size, and printed or digital format. Digital certificates will be emailed to customers (see Shipping & Returns). Note: Spelling and punctuation count! Please double-check your entries before adding the certificate to your shopping cart. Your certificate will be prepared with the exact information you enter. 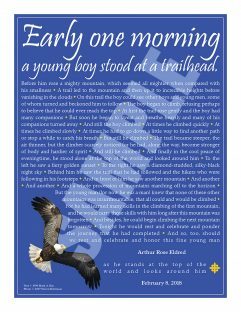 I like the Eagle Mountain Certificate and usually read it out loud at the Eagle Ceremony. 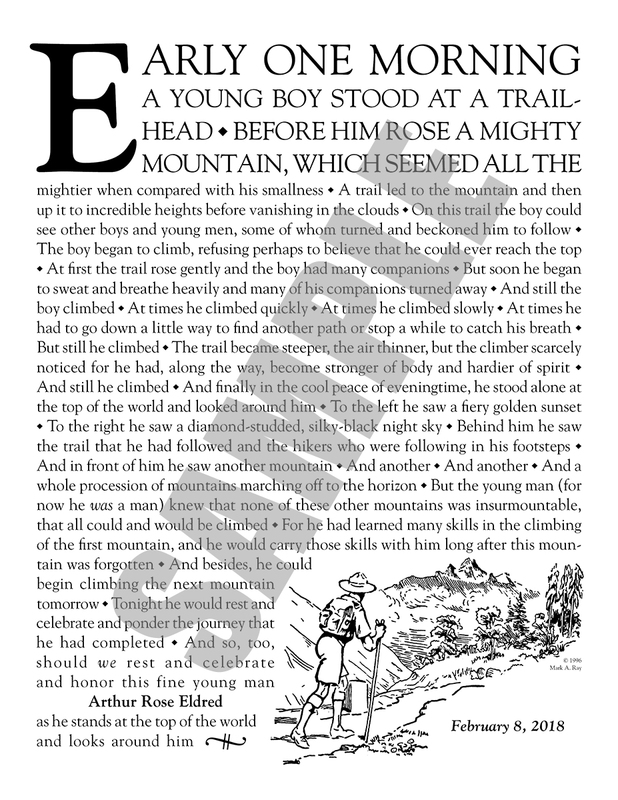 Everyone appears to like it especially what it has to say. 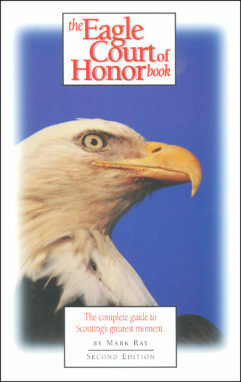 this is my go to gift for Eagle Scouts. I buy a black mat and frame which accents it perfectly. Highly recommend it was a unique Eagle Scout gift.